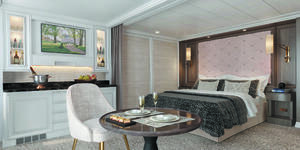 (11:30 a.m. EDT) -- Cruisers booked on (or thinking about booking) Regent Seven Seas' newest ship, Seven Seas Splendor, can get a first look inside the suites through renderings released today by the line. 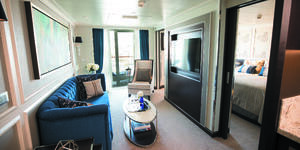 The suites will boast a luxurious yet comfortable design similar to those on sister ship Seven Seas Explorer. They will provide more square footage, however, taking after Seven Seas Splendor's Regent Suite -- soon-to-be the largest suite on any luxury ship. "Perfecting luxury is about obsessing over large and small details," said Regent's president and CEO, Jason Montague. "From specially commissioned one-of-a-kind artwork to visually stimulating touches throughout the ship, each space on Seven Seas Splendor will display finely tailored designs that offer a comfortable and stylish experience for luxury travelers. "With an expansive passenger-to-space ratio and an exceptionally low guest-to-crew ratio, Seven Seas Splendor will be one of the world's most spacious, intimate and beautiful ships ever to sail the globe." Master Suite: Inspired by New York's prestigious Park Avenue, the two-bedroom Master Suite on Seven Seas Splendor will range between 1,895 and 2,108 square feet and feature a large living room, marble and stone bathroom, and balcony providing up to an additional 994 square feet. Grand Suite: The one-bedroom Grand Suite on Seven Seas Splendor will follow the design found on Seven Seas Explorer -- a light neutral color scheme with pops of emerald. They will offer anywhere from 1,277 to 1,836 square feet, as well as two marble and stone bathrooms; a leather, floor-to-ceiling bar for entertaining; and a balcony with up to 916 square feet. Splendor Suite: Highlights of the one-bedroom, one-and-a-half-bath Splendor Suite include a dining table for in-room service, a spacious closet, marble and stone tub, and between 821 and 918 square feet with up to a 263-square-foot balcony. Seven Seas Suite: Ranging from 577 to 655 square feet, the one-bedroom Seven Seas Suite is reminiscent of a cozy, cosmopolitan apartment, with an open floor plan, oversized bedroom, marble bathroom and balcony offering an additional 166 to 237 square feet. 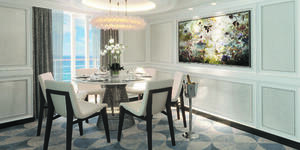 Penthouse Suite: Available in three different categories -- ranging between 448 and 642 square feet -- the Penthouse Suite affords an entertainment center that separates the bedroom and living room, larger walk-in closets and more bathroom storage than the Penthouse Suites on Seven Seas Explorer, and a balcony with up to 176 square feet. 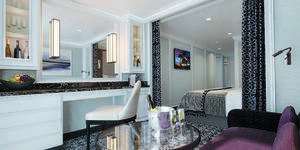 Concierge Suite: The Concierge Suites on Seven Seas Splendor come in two categories, offering between 332 and 464 square feet, with up to a 132-square-foot balcony. Standout features include a balcony-facing bed, and furniture adorned with Italian fabrics. Superior Suite: Two Superior Suite categories, ranging from 332 to 464 square feet, offer a light-filled space that includes a roomy sitting area, residential-like walk-in closet and access to a balcony providing up to an additional 132 square feet. Deluxe Veranda Suite and Veranda Suite: Each available in two different categories, these suites offering up to 361 and 307 square feet, respectively, have a spacious sitting area, coffee table large enough for in-suite dining, and curtain for added privacy in the bedroom; the balconies offer between 88 and 108 square feet. Passengers staying in the first four suites listed enjoy elevated perks such as personalized butler service, guaranteed dining reservations and customized pillows and bath products. In addition to the suites, Regent revealed a rendering of the Observation Lounge on Seven Seas Explorer. The multi-use space will feature an English garden-inspired design, with a light color palette, English-style molding, and a whimsical chandelier accented by hand-painted porcelain peonies and roses. On Seven Seas Explorer, this lounge hosts afternoon tea, trivia and lectures during the day, before turning in a dance club at night. Regent's cruise fares cover flights, standard shore excursions, alcoholic beverages, gratuities and unlimited Wi-Fi, among other inclusions; passengers have the option to pay up for premium tours.